Mrs. Robson's and Mrs. Serafin's fifth grade students are hosting a Mini Mall on December 17th to sell products they have worked hard to create and market over the past few months during an economics exploration. 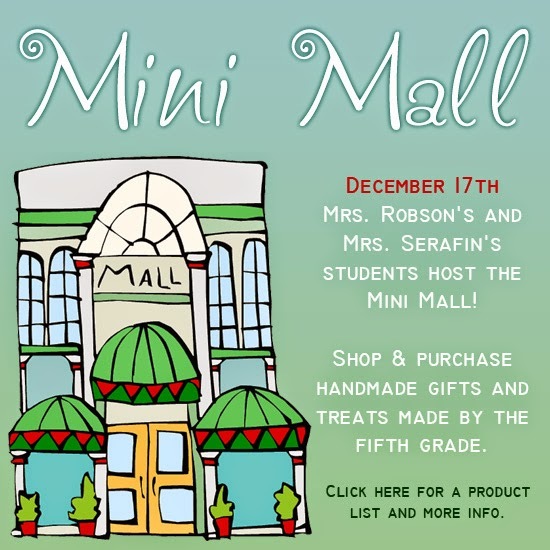 Fourth and sixth grade students will be invited to come do some holiday shopping at the Mini Mall. Look for a flyer to come home soon with information on the products being sold and prices. Fourth and sixth grade students can bring cash on December 17th to purchase items created by our fifth grade students. Kimberley called the meeting to order. There was discussion of how to get the proposed Boosters agenda out to the Teach community prior to meetings. The secretary (Laura) will submit a newsletter announcement through Janet fifteen days prior to the next Boosters meeting with the proposed agenda, asking for additional agenda items. Kimberley reported that Kate Stevens wrote and sent thank you letters to school board members and facilities staff, thanking them for their roles in the move to Teach’s new home. In the next newsletter, there will be a call for parents to help form a fundraising and financial stewardship committee for financial stewardship of Boosters funds. The committee would make recommendations to the Boosters for what to do with surplus funds, and could also look into grants, evaluating the effectiveness of Boosters fundraising efforts, etc. Melinda (co-VP) said that she could collaborate on grant writing. Brian (current Treasurer) would be part of the committee. The purpose is to propose expenditure of Boosters assets carried over from prior years and to answer the question of whether or not our menu of fundraising should change or remain the same. Establishing a policy for fundraising could be part of this committee’s activities. The minutes from the November meeting had been sent via email and posting on the Google drive. Kimberley made a motion to approve the minutes as amended; Brian Olson seconded and all present were in favor, none opposed or abstaining. Teresa Larsen, school library tech, then spoke. She herself does not track AR tests; AR test results are tracked by computer as students take tests. “Encyclopedias” that were referred to in the 11-7-14 minutes should be noted as “reference books.” Teresa will get information out to parents on how to access e-books and online reference materials. From the district website, parents can click on the link for Teach Library. Also under the Teach website, one can click on student resources. There was a discussion of establishing an Amazon wish list; however, the school district determines that books must be ordered through Tidal Wave, which catalogues the books. All books that end up in the school library must be approved through the district, so if books are purchased through a source like Amazon, they may not be approved for library use. Mike Berger called for a vote on purchasing the district librarian’s request for reference books (PO #CG158012013). There were no votes in favor of purchasing these reference materials. Kimberley, Brian, Terrie, Robyn, Kurt, Melinda all voted to NOT use Boosters funds to purchase these books. The consensus was that the Boosters would like to look into options for purchasing reference materials. ****ACTION ITEM: Robyn will partner with Teresa Larsen to help determine library needs and how to progress in obtaining books that are needed. They will bring their findings back to the Boosters. **** Brian, as Treasurer, brought up the point that there are not currently funds in the Boosters budget for funding a books purchase of $1000 (which was the amount of the reference books in that purchase order). Brian reviewed the current status of Parent Pledges (see attachment). There was discussion of how to contact those families that have not responded at all to the pledge request. Kimberley asked if each grade rep could send out an email asking each of those families to contact their grade rep(???) if they have not yet pledged. After January 16th, Kimberley is planning on calling those families who have not responded by that point. Brian reported that the Boosters indeed carries liability insurance for events, so events such as the Derby Days and other gatherings (Chili Cook-off, etc,) are covered. He also reported that the 2013-14 tax return has been submitted. In light of the liability issue being resolved, Mike moved that Boosters approve a $1000 deposit for the spring fundraiser (Derby Days). Terrie seconded the motion and all present were in favor, none opposed or abstaining. Report from Grade reps: Cerae reported that Camp Ocean Pines was fun, action packed, and full of learning opportunities. Regarding the Bog Brothers/Sisters event coming up this weekend, she was told by another parent in Mr. Crabb’s class that Mr. Crabb has spent $150 of his own money on supplied for this event. There was discussion of “service learning”: the Big Bros/Sisters event is the only Teach-supported event that is a service oriented activity. Robyn moved that Boosters reimburse Mr. Crabb up to $150 for the expenses he has incurred towards putting on the Big Brothers/Big Sisters event. Kurt seconded the motion with all in favor, none opposed or abstaining. 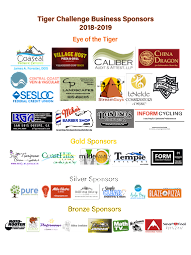 A line item will be added to the Boosters yearly budget to support this event financially. Cerae wanted grade reps to know that they have $200 per classroom for party expenses/supplies for the 2014-15year. There was a thank you to those who are helping with the Gaga ball arena. Wendy Sylvester’s business (Docu-Team??) has helped with shredding old Boosters documents; Kimberley will write a thank you note. The Teach Family directory has not yet happened; Matt Wormley has done this in the past; getting the information during this transition year has been a little tricky thus far; it will most likely come out early next year. Kimberley brought up questions that came up this week when a student transferred to Teach: if a student transfers to Teach mid-year, do we present the pledge materials and ask for a pledge amount from them? If a student leaves, do we refund any part of previously paid pledge? Kimberley will get contact information for the new family and make contact along with Cerae as 4th grade rep. There was discussion that the amount of both pledge and any potential refund would be pro-rated for the elapsed time, but no policy was proposed or voted on. Kimberley moved to close the meeting, Robyn seconded the motion with all present in favor, none opposed or abstaining. If Mrs. Robson teaches a hip hop dance class that gives us fourteen volunteers and 13 classes. Board members Present: President Kimberley Wormley, Treasurer Brian Olson, Secretary Laura Cooper, Board Member at Large Terri Marshall. Others Present: 4th Grade Class Rep CeRae Speidel, 5th Grade Class Rep Mike Berger, International Day Co-Chairs Nara Clark and Pia Laurie. Kimberley called this meeting to discuss some interim Booster items. First was a short discussion of the board composition. Laura Cooper, current board member and secretary, has volunteered to step down as a voting board member but will continue to serve as secretary. This change will be put forward and voted on at the next meeting. Laura will communicate with principal McMillen to make sure he can be there at the next board meeting, as the other board composition issue is that he must put forward a staff person to serve as a board member, and this person must be duly elected as soon as can be to ensure compliance with our bylaws. Next item was discussion of when International Day Chairs will meet and get information out to interested parents and the school community as a whole. The Int’l Day chairs are planning to meet in late January and will put out information at that time about the event and how parents can become involved. Next was discussion of Electives. Since these come up in January, the proximity necessitates information to the Teach community coming out very soon. Terrie Marshall and Mike Berger stepped forward to help Kurt Rightmeyer get information out. It has been proposed that there be a meeting on October 24th to sketch out a plan to raise up a team of parent volunteers for electives. There is continued interest in getting the Infosnap volunteer data so that other chairs/reps/board members may know which parents have already indicated their volunteer interests. Nara indicated that the Infosnap data had already been transferred to Christine Kimball. Kimberley will follow up with Christine. Mike Berger moved that the Boosters add a Teach Boosters budget line item of $300 for International Day. Brian Olson seconded the motion which carried with all board members present (4 board members) in favor, none opposed or abstaining. Mike Berger moved that the Boosters add a budget line item of $500 for Electives. Kimberley seconded the motion which passed with all board members present (4 board members) in favor, none opposed or abstaining. There was discussion of recess equipment, but this topic was tabled until Principal McMillen can be present to help guide options in terms of safety concerns, etc. There was discussion of how all the classes were doing in terms of pledge forms. Laura will contact Wendy Sylvester, 5th grade room rep, to see if Wendy can email parents in a way similar to CeRae’s contact with 4th grade parents, to raise awareness of need for those forms being returned so that the Boosters know what all families’ needs are in terms of assistance or ability to donate funds. Kimberley will follow up individually with families who will follow up individually with families who have neither turned in a pledge form nor submitted a pledged donation. Brian will send the latest numbers on monies collected, pledge forms received by class to all board members and reps/chairs so that they have this information when talking with parents. There was a question about what teachers wanted in terms of class parties for the year; CeRae will check and see what teachers have decided about parties for the year as teachers were going to select dates for class parties. She will bring this information to the November meeting. CeRae reported that she has been organizing GoogleDocs and making new folders organized by year so that the most recent info can be more easily located. She asked for feedback from people in terms of if this was making it easier to find items to assist in the process. The immediate reaction was one of gratitude for CeRae having taken on such a worthy and onerous task. Kimberley has been cleaning out the Boosters storage area, and found a cache of outdated electronic equipment. She will put an announcement out to the Teach Community to see if anyone has a claim to any of it; what is not collected by the end of December will be donated or otherwise disposed of. She also has found boxes full of outdated financial records, which will be shredded if the records are older than 7 years. Wendy Sylvester has offered the shredding services of DocuTeam for this. Kimberley will bring boxes to the Nov. Boosters Board meeting so that people can assist with pre-shredding prep after the meeting wraps up. There being no further business, Laura Cooper moved that the meeting be adjourned; Mike Berger seconded the motion with all present in favor, none opposed or abstaining.